Whether driven by desire or by radical rebellion against bourgeois norms, the ménage à trois is a recurring trope in the rule-breaking French New Wave. This program highlights some of the most trailblazing trios in French cinema, along with some lesser known threesomes. Paris, 1907. Austrian writer Jules (Oskar Werner) and French dandy Jim (Henri Serre) share a profound spiritual friendship. When they meet the charming and enigmatic Catherine (Jeanne Moreau), the duo suddenly becomes a turbulent trio. In this celebrated classic, Francois Truffaut passionately charts the lives and complex relationships of three people who are committed to reinventing love and happiness outside of the schemes of bourgeois society, and who are prepared to pay the inevitable price. 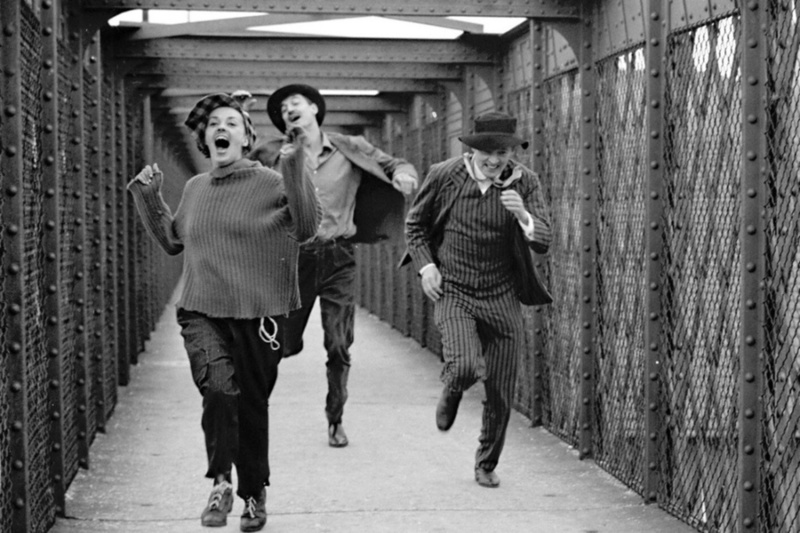 Truffaut deploys cinematography that is at once joyful, audacious, and refined. The fluid camerawork and bold, inventive editing techniques complement Michel Subor's vivid voiceover, making this an important early film in the stylistic development of the French New Wave. Watch the trailer. Directed by Francois Truffaut, 1962, France, 105 minutes. In French & German w/ English subtitles.